Onaiyakan gave the advise in Abuja on Tuesday while celebrating the New Year mass at SS Peter and Paul Catholic Church, Nyanya. He said President Muhammadu Buhari had promised to ensure free and fair election and so prayed for God’s intervention to make it come true. “It is the government that is responsible for free and fair election in any country, the government has all the necessary things to make it free and fair,” he said. “The use of security agents should be handled properly to ensure that voters are not intimidated during election,” Onaiyakan said. He prayed that Nigerians would elect good leaders in the coming election that would address the challenges of the country. Onaiyakan said that the country was faced with corruption, unemployment and poor infrastructure. According to him, other African countries have moved ahead leaving the giant “Nigeria” behind. 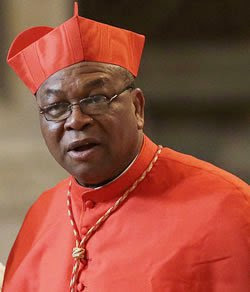 The Cardinal said that most countries suffer from national disaster while Nigeria was faced with human disasters and urged Nigerians to serve God more than ever before. He further called on Nigerians to pray that peace, progress and unity would pervade the length and breadth of the country. Onaiyakan said that great exploits would only be achieved through unity of purpose, brotherhood and peace. He advised those that would eventually emerge winners in the election to have a sincere and honest mind in order to serve the country better.